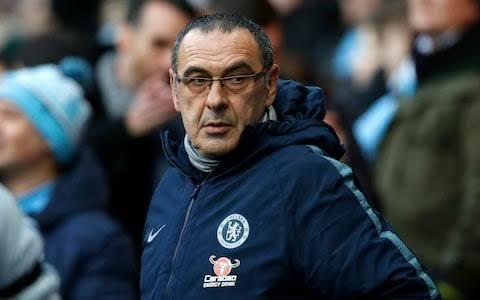 Following the match, Sarri noted that he had heard what some Chelsea fans had been saying. 'I have been used to it in the last 45 years so I know very well the reaction,' said the Italian. 'Probably it was best to wait until the end of the match but for me it's not a big problem,' he added. Wonderkid Callum Hudson-Odoi was left on the bench by Sarri, alongside Eden Hazard and N'Golo Kante, in a bizarre line-up. The Italian brought on Ruben Loftus-Cheek late on, and he scored the match-winning goal The Italian brought on Ruben Loftus-Cheek late on, and he scored the match-winning goal It is believed the strange starting line-up irked many fans, who began to chant 'f**k Sarri-ball' just 30 minutes into the contest. Blues fans also turned on the Italian with chants of 'you don't know what you are doing' before calling for his head, while their side was trailing in the game. Late goals from Cesar Azpilicueta and Ruben Loftus-Cheek were enough to see Chelsea leave south Wales with all three points.